This week for a friend's birthday we decided to hit up the local roller skating rink for their "cheap skate" night. I think it will be fun, as I used to be a regular in elementary school though haven't been on skates in probably 12+ years! I thought it was perfectly timely for a blog post since I've been seeing roller skates as a theme popping up in editorials and photoshoots like crazy. 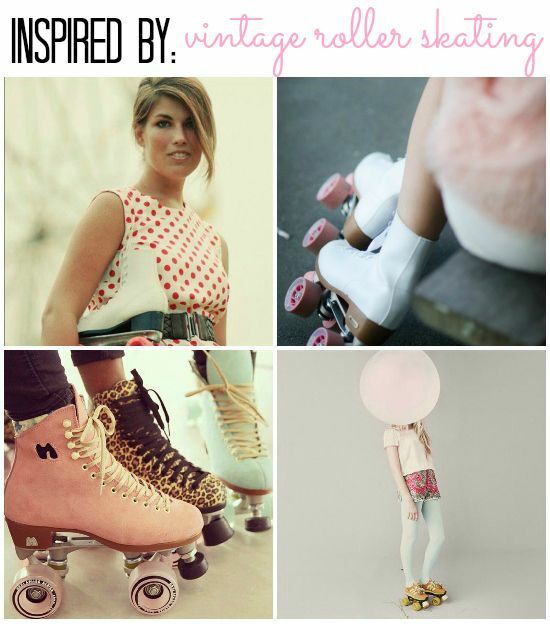 I think especially in these pastel shades there is something so perfectly feminine and nostalgic about roller skating. How amazing right? I love that Urban Outfitters is selling the oh-so-cute Moxi Roller Skates pictured in the third images. I totally encourage you to get all of your girlfriends together for a cheap skating night in your town as a fun throwback to your childhood. Did you go rollerskating as a kid? the pink and leopard ones! Astro Skate aaaah! Brings back lots of fond childhood memories. I like the retro feel of roller skates. Have fun! Such an amazing inspiration board. I love the look of vintage roller skating. I think I need to find a roller ring near me. Happy Valentine's Day from LPF!